Social media newbie Pinterest ended 2011 strong. Rapid growth pushed it into the top 10 social media sites based on usage. And now, like anything popular the business and non-profit world is trying to figure out how to use Pinterest as a marketing tool. Since Pinterest wants to connect people based on their similar interests, brands and organizations, who are interesting to a lot of people, want to be in the fold. If you’re not familiar with Pinterest, here’s a basic rundown. The idea is simple and easy to use. The company describes itself as a virtual bulletin board where you can share your favorite images and videos from the internet and pin them to your board. You can create multiple boards to separate and organize your stuff by interest. Others on Pinterest can follow you and share (repin) what you’ve posted. Confused by some of those terms? Here’s a little more detail. Pin: It’s the image (or video) that you post. It’s like a virtual version of you takes a push pin and attaches something to a bulletin board. (Below we’ll talk about how to pin something.) Once you pin something, it always links back to its original source or webpage. Board: This is where your pins go. You can create and name multiple boards to organize your pins by interest. Repin: Once you’ve pinned something your board, other people can look at it. If they like it, they can repin it onto their won board to share with their followers. Just hover over the pin to get this option. 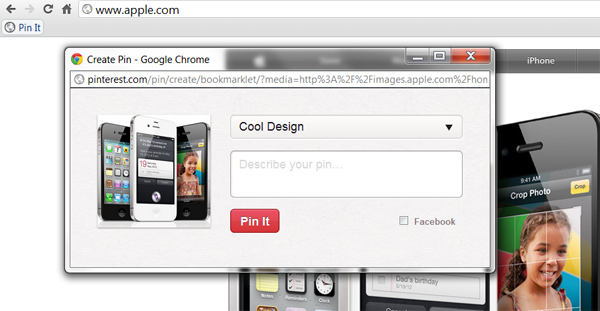 Download the “Pin It” web browser extension. This puts a little button at the top of your browser. If you see something you like on the in web, click the Pin It button. It will show you all the images on the page. Pick which one you want, write a quick description and pick which one of your boards you want it on. Your pin will link back to this page. Smartphone app. See something you like, take picture with the app and add it to a board. You can also browse other content and repin stuff you find interesting. Upload pins on your computer. Click “add in” the top right corner of the Pinterest site. You can add a pin, upload your own stuff or create a new board. Here are some other basics to know for using Pinterest. 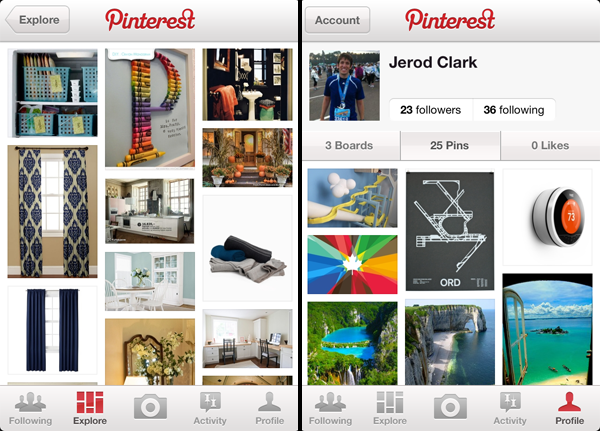 Follow: Like other social media sites, you can follow other users and their pins appear on your Pinterest homepage. You can follow everything a person pins or just a particular board. Mention: When you’re writing a description for something you pin, you can mention someone you follow. Similar to other sites, just put the @ symbol right in front of their username. Comment: Like almost everything on the internet, you can comment on any pin. Follow Button: You can add Pinterest buttons to your website to direct people to your Pinterest page. Getting an account: Pinterest is technically still available by invite only. When I signed up, I got an email almost immediately. Others say it could take a couple of days. I’ve been casually using Pinterest for the last few months and can say it really is a simple way of visually sharing things you find cool. My very general observations, along with what I read, tell me the audience on Pinterest is heavily female and the most popular interests revolve around crafts, fashion and food. Again, there is much more to find on Pinterest, but this seems to be the trend right now. Here’s what I like about Pinterest: It’s different than the other major social media players like Facebook and Twitter. For an organization, it’s less about pushing your own stuff and more about sharing your culture. What makes your church unique in who it is? Or as Pinterest Co-founder Evan Sharp says, "For most consumer brands, the idea behind your brand makes sense on Pinterest." And it’s also why this social media outlet could be useful for your church. It’s your chance to not just share yourself but share things you agree with or things that will be useful to your members or your community. Now that you know the basics, explore Pinterest more by looking at ways churches can use it. Here's a link to Pinterest for Churches (Part 2: Strategy). Is it even possible to get an account with an actual Facebook Page yet? I thought they just did personal Facebook profile accounts. I’m not sure about the Facebook Page side of it. I was able to set up a Church Juice account just using an email address. That said, we haven’t done anything with the Church Juice page yet. That my friend would be the opposite of a best practice. Well said. For someone looking to get started on Pinterest, this is a great explanation of what Pinterest is all about. I’d also like to mention that Pinterest is quite therapeutic. You might find yourself spending much of your free time on Pinterest. I’ve had multiple people of late tell me about Pinterest. It seems to be quite popular. There are a lot of ways to market how you want to communicate what your church is about. Successfully reaching out to people will come from different mediums. Professional email marketing, social media sites like Pinterest, or good ol’ word of mouth are just a few ways to spread the word. For the visual viewer, Pinterest has a lot to offer.